Paul’s Fan Company provides a wide range of mining and industrial ventilation services for industrial and underground ventilation systems. 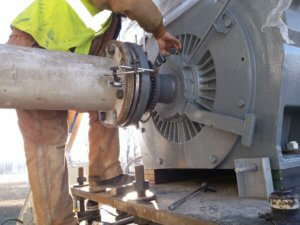 We offer a wide range of mining and industrial fan services. If you have an underground or industrial ventilation system that needs maintenance or repair, we can help. We have expertly trained staff available 24/7 to help with all your mining and industrial ventilation repair needs and coordinate any emergency repairs. At Paul’s Fan Company, our team can design, build, and install your entire ventilation system. We have complete fans, ventilation parts, and fan blades in stock for nearly all makes and models. We can also custom fabricate hard to find fan components. We manufacture and install custom designed ducting for your ventilation system and offer a variety of silencing equipment to satisfy noise regulations. We provide laser alignment and computer balancing services at your job site. Our in-house project management service can save you time and eliminate scheduling problems. "To put it simply our success depends on Paul’s and they have NEVER let us down! I can’t say enough about their willingness to help – day or night, holiday or weekend – we can always count on them. I thank them for their continued support and professionalism. I highly recommend Paul’s for any work you may have." "We would like to take this opportunity to thank each and every one of your staff for the quality of workmanship that you all dedicated to the Fan Installation that was done at Kingston. The work ethic of each man that was present on the job site was something that is rarely seen in this day and time. In our opinion, you all are the best." Need to Schedule Service for a Fan? Contact our team to schedule industrial or underground ventilation maintenance or repair or to learn about our other ventilation services.